Held annually for the past four years in Kowloon, the 5th one which was held this year at the scenic Victoria Harbor has a bigger area to usher in more guests for the event. Wine lovers, connoisseurs or even the newly initiated like me had fun exploring the different wine zones: the Everyday Wine Zone, Party Wine Zone, Discovery Zone, Country Pavilion, Riedel Grand Tasting Pavilion and the A-Lister Zone. And attending the Wine & Festival was the main reason why I ended up in Hong Kong after winning the food review contest sponsored by OpenricePh. 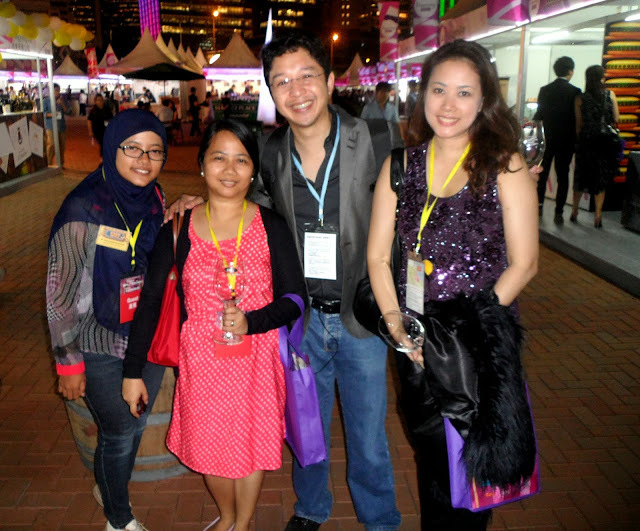 There's nothing equally thrilling for a food blogger like me than to be invited to special food events such as the American Express Hong Kong Wine & Dine Festival 2013. I mean, I get to travel just to drink wine and eat- how cool is that? The one pictured below is the other Openrice Philippines winner- SavvyAboutNothing. I think he's the tallest in our group. Ayan, free publicity for Savvy! Haha. Just look at the photo, he almost didn't fit in the frame. Upon registration, we were given the purple bag that has a wine glass that we can use to sample the wines. Nice. Openrice Hong Kong already gifted us with a special wine glass upon checking in at the hotel the day before so receiving another wine glass was a pleasant surprise. Thank you. :) Read more about The Great Hong Kong Food Adventure Day 1. The venue was really huge but there are a lot of wine merchants on the different wine zones that it seemed impossible to check each and every one. I lost Savvy after sampling City Garden Hotel's abalone so I made a quick tour of the Everyday Wine Zone and some of the stalls selling food. Okay, shoot me for being a food blogger- I like food. 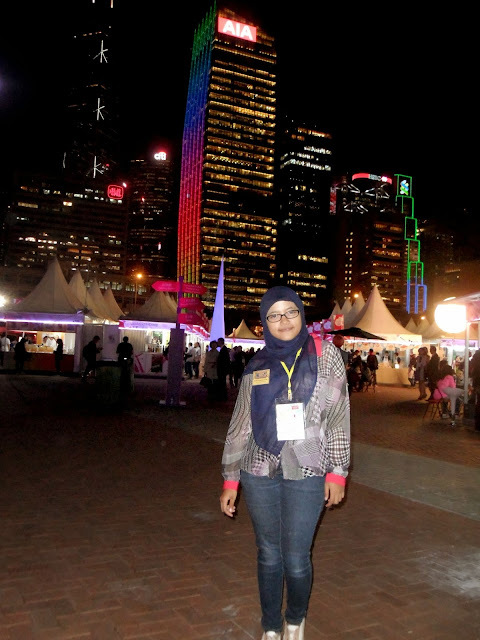 Then, Putri from Indonesia suddenly appeared in front of me asking if she can tag along. No problem, and gave her my friendliest smile. Its fun to discover new things (in this case, wine and food) but it is much nicer to discover new things with a friend (a new friend!). Included in our purple bag, are some vouchers that we can use for wine and food sampling. There are about six vouchers for wine which includes regular and special wines, the other vouchers for food, cookies, chocolates and gelato. The wine glass really looks nice. It even sounded nice, too. So that's me in the photo below with my first glass of wine. Can't remember the name of the wine but I got attracted to it because of the bottles. No kidding. Also, when I asked the one manning the stall if the wine is sweet, he said yes. Lucky me! I can't adapt to dry or semi-dry wines. Fruity sweet wines are the best for me. See how happy I am? And not only that, he didn't ask for my wine voucher- he just gave me some wine although I suggested that he should just pour a small amount because I don't want to get tipsy. And I love my first glass of wine here. Its sweet and fruity and chilled (another plus factor). Here's another stall that caught my attention. I just love the rich colors of these bottles and I can identify with mimosa and peach bellini. I haven't really tasted both but I've read about them if that counts- haha. So I tore off a voucher and got myself a small amount of peach bellinni. Now this is more fruity and richer in flavor than the first one I've tasted. You really won't notice the alcohol content but its there. These two girls are the winners from China. I think they had a glass of bellinis or maybe mimosas. Cheers! Aside from the wine tasting, the guests also have the opportunity to pre-order bottles of wine at a discounted or special rates. Alas, they don't sell at the venue but you can get their cards and visit them in the stores in Hong Kong. Trivia: there's no import taxes for wines in Hong Kong. Nice looking wines. Very chic! Bordeaux Village. Of course, everything in this area comes from France. Aside from wines, Putri and I were also able taste and use our vouchers for cheese. I even had mine wrapped so that I can bring it home with me when I go back to Manila. That's the map, just in case one gets lost. Actually, its really easy to navigate around the whole area but it was really a very organize affair and there are lots of Wine & Dine Staff roaming around in case you have questions or needed help. Another "girly" looking bottle. I'm drooling over the bottles. I want to keep the cute ones including the wine inside. Lol. I had another glass of this and it tasted pretty good, too. Sweet and nicely chilled! Perfect with the stick of cheese that I got from the Bordeaux Village. The ones on the photo below are called wine-pouches. I've only seen them in old movies so I was happy to see one up close. Nice as gift ideas, too especially with coming Christmas Season. Bumped into a friend also. That's RJ Ledesma and his wife Vanessa. He and his crew are taking some videos of the Wine & Dine Festival. Happy to see a familiar face at the event. I directed them at the booth called, The Dutch. They're selling cheeses, of course and they happen to have the yummiest pesto cheese. I bought a pack (yes, another pack of cheese) to bring home to Manila. Will write about the cheese review soon. That's Putri, the Openrice winner from Indonesia. She's a university student and dreams of working for the United Nations. Go Putri! ... and cookies and other sweet goodies. Such a wonderful gastronomic adventure..you are really going places my friend..hoping to tag along in one of your future food blogging trips even as a personal assistant perhaps?